The Fyreslayers were one of the first armies to get released for Age of Sigmar, and the second all-new faction after the Stormcast Eternals. Now that we're firmly into the second edition of the game they've gotten a new lease on life with a brand new Battletome complete with updated lore, new warscrolls, and a ton of new artifacts and traits! The cover to this book is superb, as is pretty much all of the art throughout! This is practically a Kevin Chin art book, since he's done so much of it, which is only fitting. He definitely has an amazing grasp on the Fyreslayers as a faction. You really get a sense for how stout and stubborn these guys are with the central figure, and I love the inclusion of the tattoos. That's something we used to see all of the time on the Slayers of old but was mostly absent from the Fyreslayers' first iteration. now it's like we're getting a fusion of the two. The only minor complaint I have is that the colors seems a little greyed out. I've seen a digital version of this artwork where the colors pop a lot more, so I'm assuming they desaturated it a bit for the actual book cover for some reason. That's really such a minor complaint though. 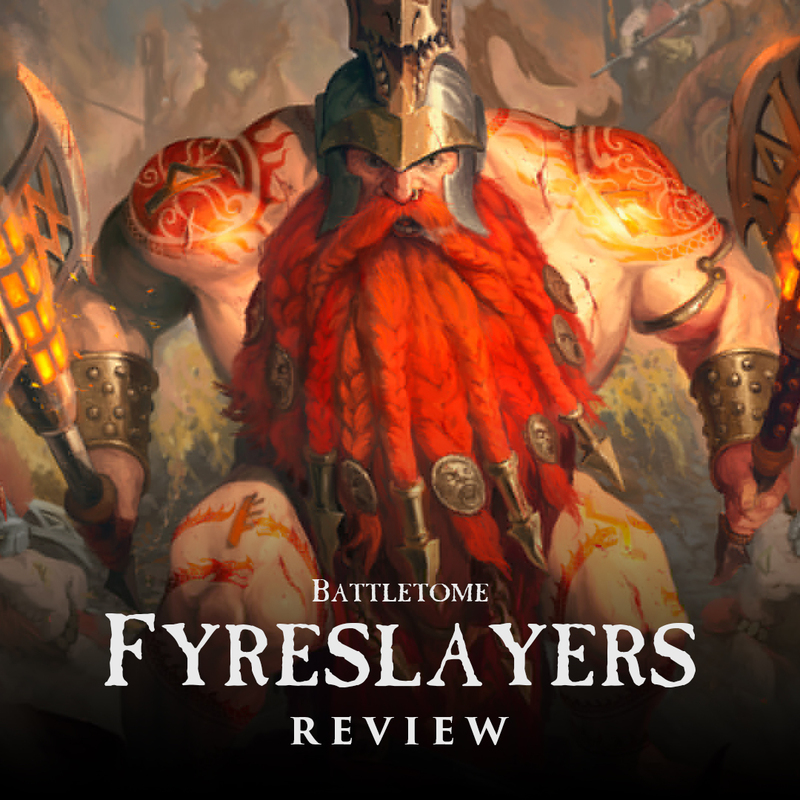 The lore section opens up with a general overview of who the Fyreslayers are. The basics of the race have stayed more or less the same from the first book, but for those of you who may be new to these mercenary duardin, I'll give a brief overview. 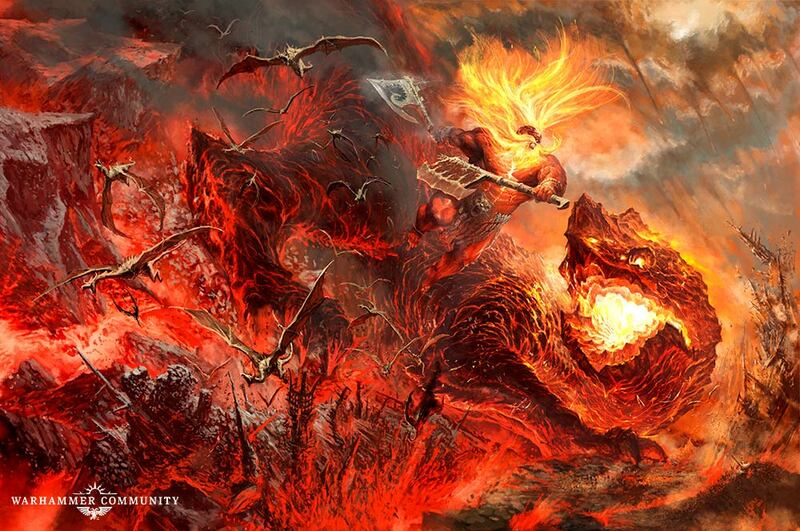 The Fyreslayers are the followers of Grimnir, one of the duardin gods. Their origins in the Age of Myth are a little but shrouded and lost, but once Grimnir died battling Vulcatrix that's when they really started making a name for themselves. When their god died in his battle with the godbeast, his essence, along with that of Vulcatrix, attached itself somehow to the substance known as ur-gold, which then rained down across the mortal realms. Now the Fyreslayers seek to reclaim as much of it as they can, either through conquest or payment. They hire out their services to anyone willing to pay them, in hopes that some of the gold they'll receive will be their precious ur-gold. They then forge this gold into runes and hammer it into their own flesh to imbue themselves with some of their god's might. 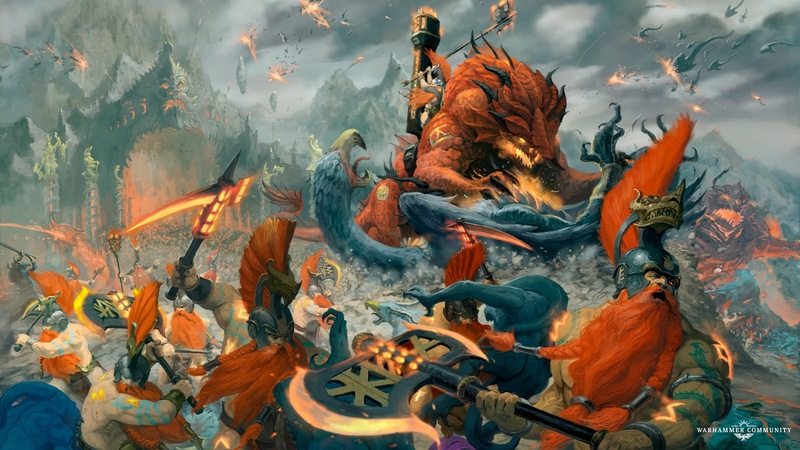 They are found all across the mortal realms, but originate from, and are most prevalent in Aqshy, the Realm of Fire. Like most other duardin, they make their homes under the mountains, often in volcanoes. The original magmaholds of the Fyreslayers were founded in the Salamander's Spine mountains in Aqshy, and were home to all of the original lodges. During the Age of Chaos, all of these magmaholds were wither destroyed or abandoned, with only the Vostarg retaining their original lodge name. 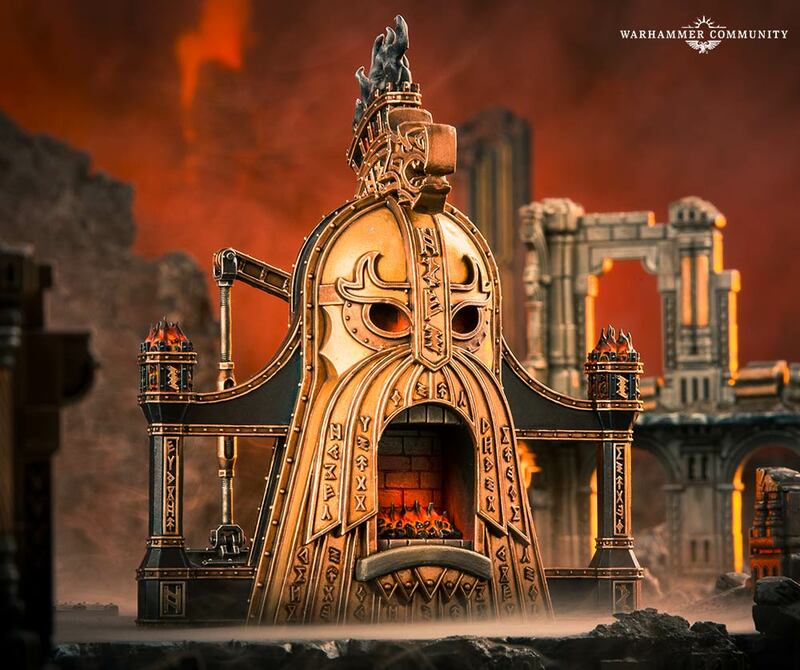 The Fyreslayer lodge is centered around a singular patriarch, the Runefather. His lineage is what holds the lodge together. Their entire society is centered around war since they seek to recover as much of the ur-gold as they can. They make a mention of the mysterious absence of female Fyreslayers, which is merely a misconception by outsiders. Females are definitely in the minority though, with them being born in disproportionately low numbers. They are the masters of defense, healing and hearth, and there's even a mention of Fyrequeens. Secure in their magmaholds, the Fyreslayers rode out the worst of the Age of Chaos, though a few did fall, usually due to deception and subterfuge. Another staple of their society is the Zharrgrim priesthood. This organization holds the secrets of the ur-gold and how to use it in battle. They were also the first to find the magmadroth eggs and determined how to raise them. 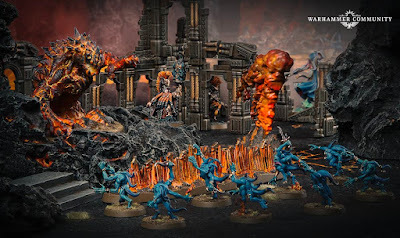 Since the necroquake they are also able to call magmic elemental manifestations to the battlefield, as well as raising forges from the molten rock. It then goes into a bit of detail on the original magmaholds, Vosforge, Harrworld, Karadrum, and Drakenhal. Though all of these have been lost to the Age of Chaos, their ancestors still fight in the form of the Vostarg, Greyfyrd, Hermdar, and Lofnir lodges. Each of these gets an exploration, some of them getting their own page, while others have to share the space. Like I said before, only the Vostarg kept their original name and can trace their lineage directly back to their founders. 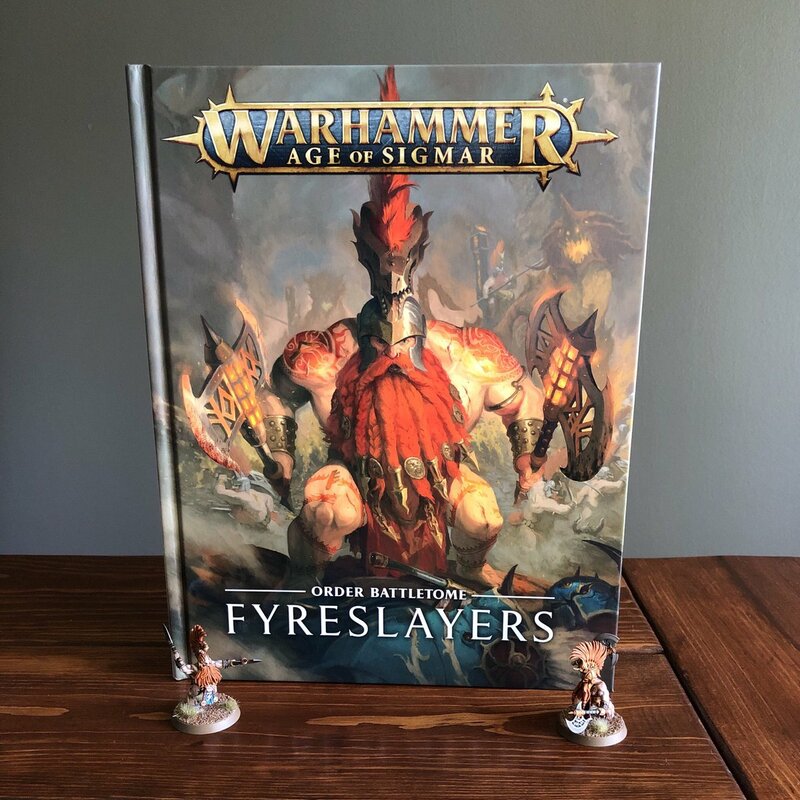 They are the traditional looking Fyreslayers we are all used to, and the ones featured most prominently throughout the Realmgate Wars books. 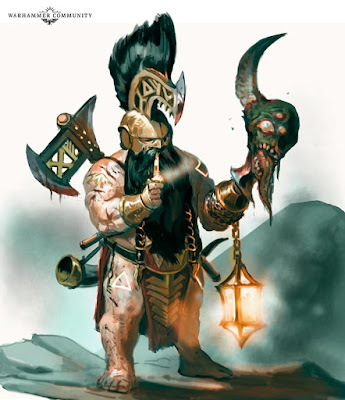 The Greyfyrd are probably the second most iconic Fyreslayers, with their black and white beards that have an internal fire to them. They're now in Chamon, with their magmahold home to many realmgates, which allows them to crusade across the mortal realms. 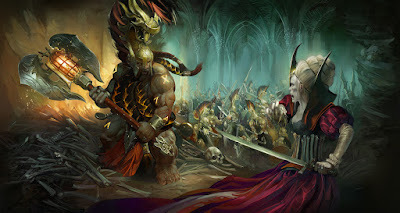 The Hermdar are unique amongst the Fyreslayers since they will often fight against tyrants and despots for little or no payment, merely doing what they see as right. They are considered to be a little "off" by the rest of their kin. The Lofnir make their home in Ghur and have mastered the art of raising magmadroths more than any other lodge, allowing them to go to war with plenty of the beasts by their side. What I think is the coolest update to their lore is the advancement of the storyline through the Soul Wars. We get a brief recap of what this entailed in general, with Nagash's plan and how it went wrong. The interesting part though is what happened to the Fyreslayers. Their magmaholds were near impervious due to their volcanic defenses. Unfortunately for them, that does very little against the Nighthaunt when they can just pass right through your walls. Pretty much all of the magmaholds within Shyish were gutted by the spectral forces, their forges extinguished, and the surviving Fyreslayers forced to flee. This has left the lodges either wandering Shyish in search of redemption, vengeance, a new magmahold, or fleeing into one of the other realms. 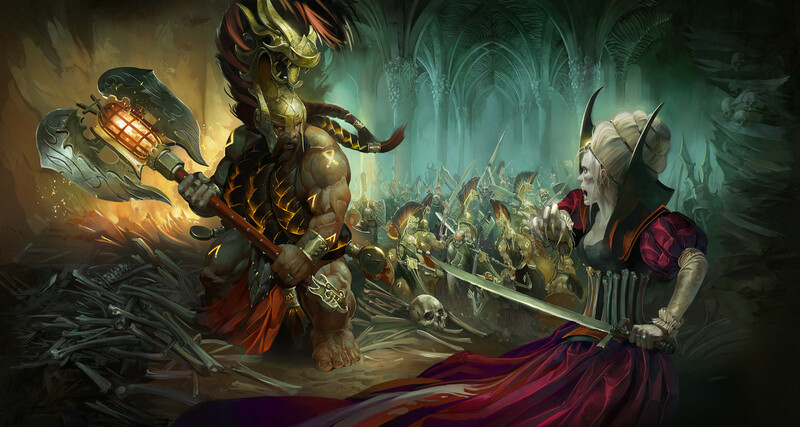 The timeline section covers everything from the dawn of the Age of Myth up through the Soul Wars, with some interesting story hooks scattered throughout. Next we move into the individual unit descriptions. There isn't a whole lot here that we didn't already know, but we do go into a bit more detail on everything, which is nice. The Doomseeker from the Silver Tower game also officially gets an entry in here now. They're the closest thing we have to the traditional Slayers of the old world, seeking a worthy death out amongst the realms for some real or perceived slight on their honor. The miniature gallery section shows off all of the 'Eavy Metal Fyreslayers we're already familiar with. 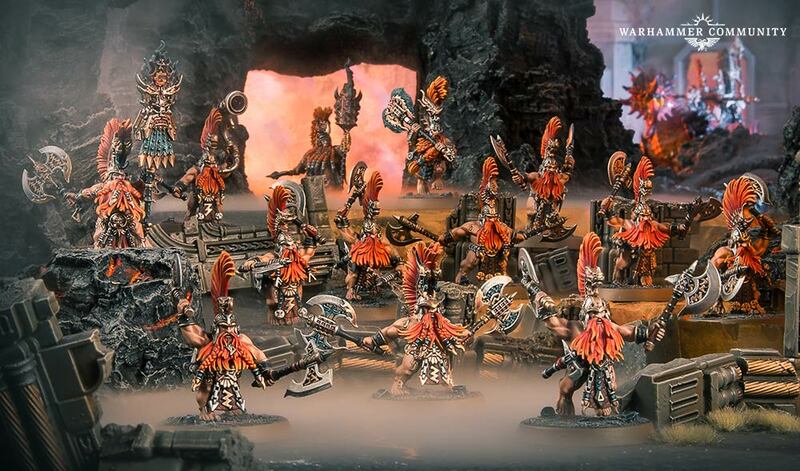 There's some really cool photography in here though where they've really captured the look of the Fyreslayers at war. Again, I really love the direction their photography is going in and the extra work that's being put in to make sure they have scenery that fits the army. There are painted examples of models for all of the major lodges, as well as several minor ones. The painting guide section gives you step by step guides for painting their flesh and hair, along with a bunch of other randoms bits, like the purple smoke on the lodge from Shyish. It goes without saying that the artwork throughout this book is fantastic. I really love Kevin Chin's style, and the stark contrasts we get between the blacks of the stone and bright reds of the magma in a lot of his work just really stands out. The majority of the art throughout this is his. Even the page borders are done by him, and I think they're definitely the coolest looking border art yet. Really, every page in this book is gorgeous thanks to his artwork, even when it's just a little spot illustration. Now we move onto the rules, and these fiery duardin got a lot of new ones. The allegiance abilities more or less stayed the same as what we had in the General's Handbook. The Ur-Gold Runes ability gives you six different runes to pick from and at the start of each of your hero phases you can choose to activate one of them. You can't repeat runes, but you can activate them in whatever order you want to. Each time you activate a rune you roll a dice, on a 1-5 it activates as normal, and on a 6 you get the Enhanced Effect as well. For example, there is the Rune of Fury, which allows your entire army to re-roll hits rolls of 1, with an enhanced effect of adding an extra attack onto all melee weapons. The Rune of Awakened Steels adds 1 onto your rend characteristic, while the Rune of Relentless Zeal increases your movement. Each of these effects only lasts until your next hero phase, but if timed right, can give you the boost you need when you need it. Turn one you might want to use the Rune of Relentless Zeal to close the gap faster, while once you're in combat you may need the extra hitting power. I think this is a really flexible and tactically rewarding ability, since it relies on you knowing when best to use each effect. As an added bonus it feels completely thematic as well! I can definitely imagine your priests activating the proper rune when needed. There are two sets of Command Traits to pick from, one for Runefathers and Runesons, and one for the different Priests. There are a number of good ones in here and they all seem fairly balanced with each other. I always like it when there are a number of viable choices instead of one stand out one that will get picked every time. The Spirit of Grimnir allows you to use the enhanced effect of each rune on a 5+ instead of a 6, while Honour of the Ancestors makes your Fyreslayer units wholly within 12" of the general immune to battleshock. That can be vital in larger units. Master Priest for the priests' command traits seems pretty solid, allowing you to re-use a Rune already previously activated. Two turns in a row of improved rend can be deadly. There are a whole host of artifacts to choose from with four different sets. 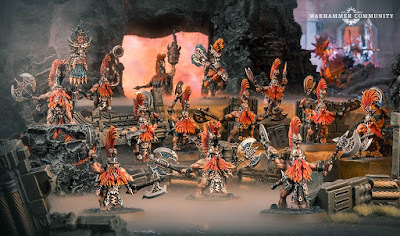 There are six to choose from for the Runefathers and Runesons, six for the priests, three for the Grimwraths and Doomseekers, and another three for the Battlesmiths. The Obsidian Glowhelm gives you a way to recoup spent command points, which is always welcome. The Beastslayer artifact for the Grimwraths and Doomseekers turns hits against Monsters into 2 hits, making them great monster hunters. There are also a few anti-magic items for the Battlesmith to take to help with unbinding since there are no wizards in this army. 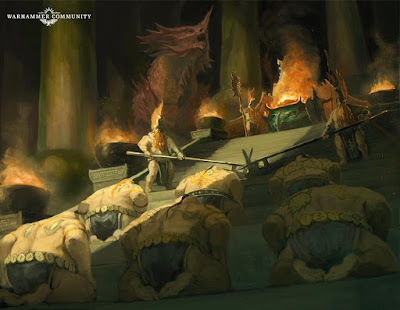 The magmadroths aren't left out either, with six traits for them to choose from, with abilities to boost their damage output or their survivability depending on if they're a youngblood, an adult, or an ancient. The Zharrgrim priesthood now has six prayers to choose from as well. Each priest in your army can choose one additional prayer from this table on top of the one on their warscroll. Ember Storm will be great, allowing you to pick a Vulkite or Hearthguard Berserker unit and giving them the ability to run and still charge. Prayer of Ash is another great one, allowing you to give a friendly unit +1 to their save. 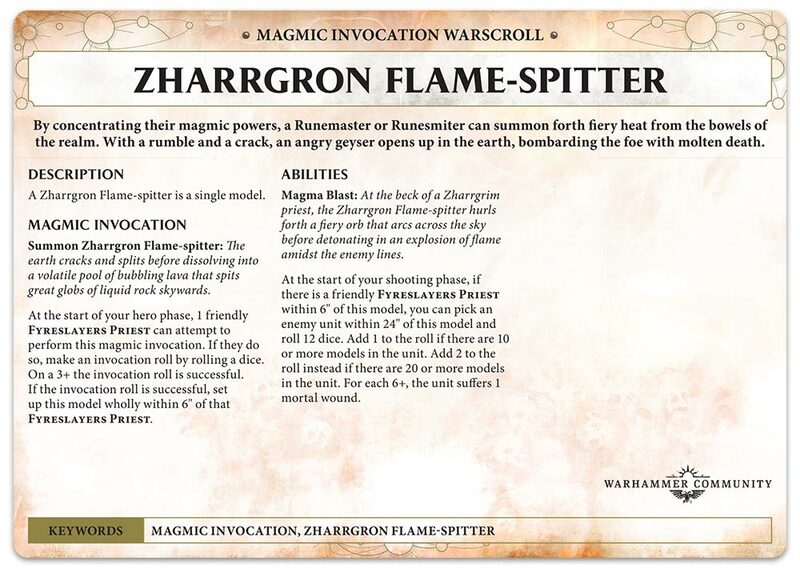 Since there are no wizards in the army, the Fyreslayers get Magmic Invocations instead of Endless Spells. These operate similar to how the "endless" prayers in the Khorne book worked. They're summoned onto the battlefield with a prayer roll, which will be noted on their warscroll. Only one of them moves, but it moves in your hero phase, instead of in the Endless Spell phase. At the end of each battle round you have to roll to see if it goes away. On a 1-3 it disappears, otherwise it stays. If you have a priest close enough to it you can add 1 to your roll. There is even a prayer you can take, Molten Infusion, which lets you pick a Magmic Invocation on the table and then you don't need to roll to see if it goes away. 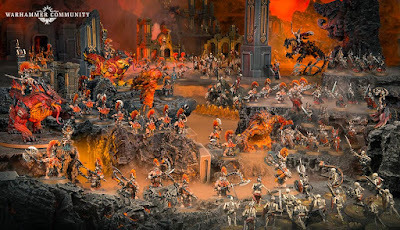 The other new addition to the army is the Magmic Battleforge, this is their army specific scenery. It's set up within your territory, within 6" of a priest, after you have both finished deploying. So you need to make sure you leave enough space to set it up. This gives you +1 to your prayer rolls if you're within 18" of it, as long as one of your priests is within 6" of it to "control" it. You can also choose to expend all of it's might once per battle if you have a priest within 6". This allows you to re-roll saves of 1 until your next hero phase for your entire army, but then the forge does nothing else for the rest of the battle. 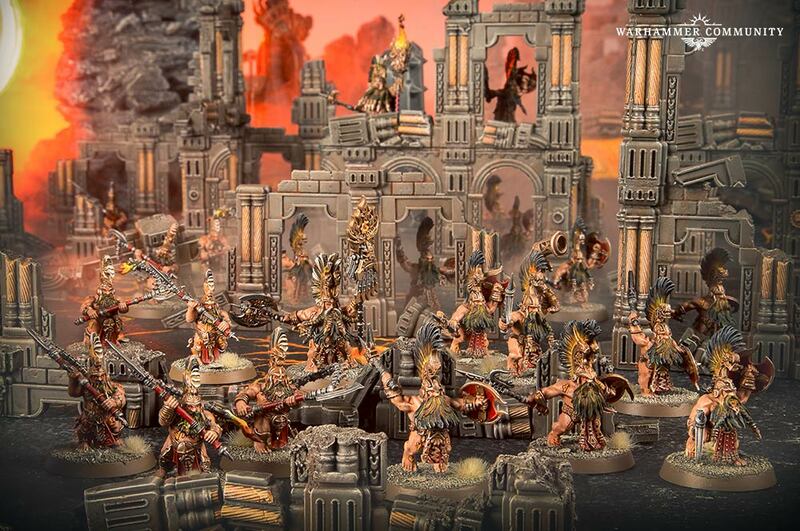 Like most other recent Battletomes, the Fyreslayers get their own version of the Stormhosts, or Lodges in their case. There are four to choose from; Vostarg, Greyfyrd, Hermdar, and Lofnir. Vostarg is the lodge for you if you plan on having a lot of bodies. 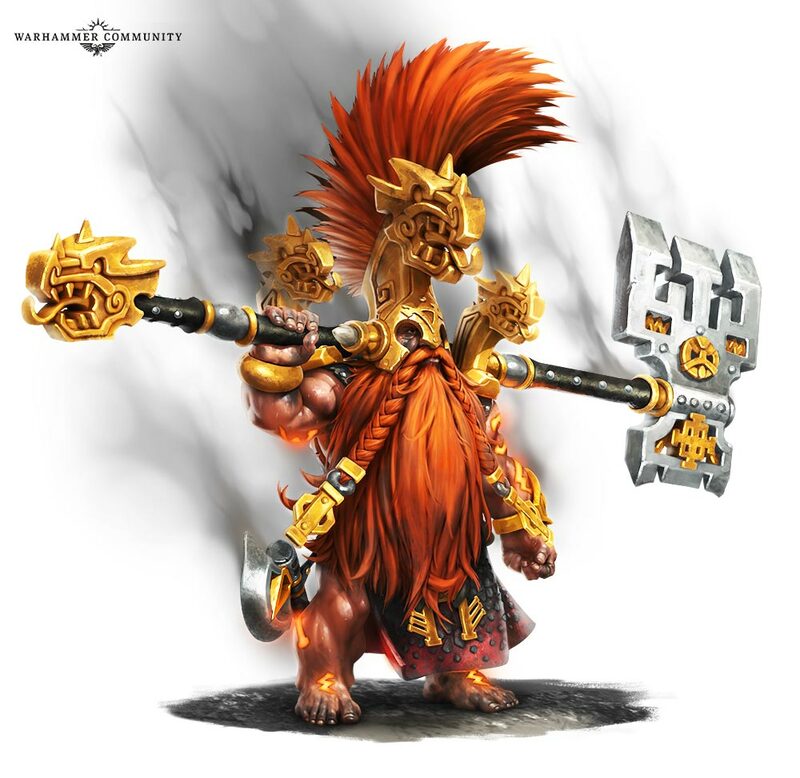 Their ability, command ability, and command trait all work in concert to get your Vulkite and Hearthguard Berserkers into combat faster, and then hitting harder once you get there. The ability, Fearsome Surge, gives you +1 to your charge rolls, while in your first turn all of your run rolls are just a straight extra 6". The command trait then lets you run and charge if you're close enough to the general, while the command ability gives you +1 to hit to all units that qualify within that hero's bubble. All of this combines to make them an angry wave of orange duardin. Greyfyrd on the other hand is all about the heroes. You can take extra artifacts, do chain combats when one hero fighting lets another hero nearby fight right away, and other buffs to your heroes. Hermdar may end up being a popular Lodge. Their ability, Seize by Force, means friendly units wholly within enemy territory or 12" of an objective don't take battleshock tests, which again, is huge for large units. 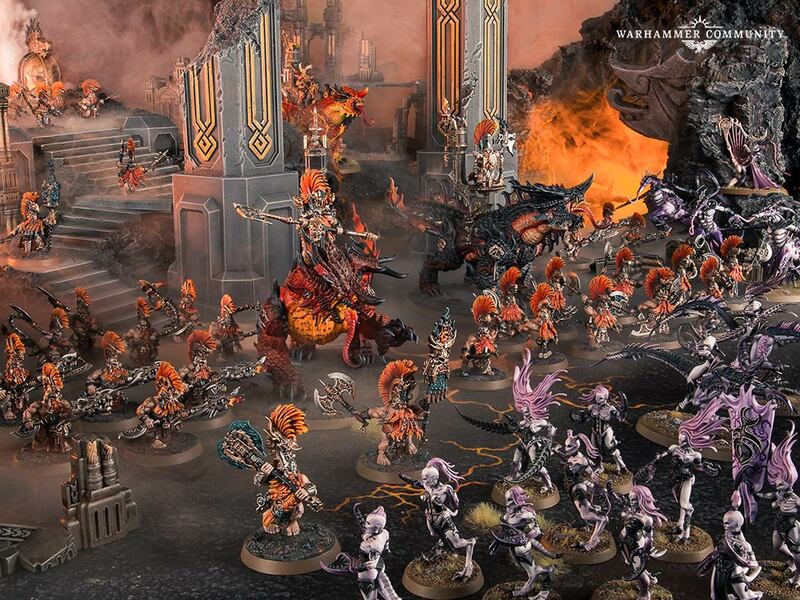 What really stands out though is their command ability which allows you to pick a unit of Vulkite or Hearthguard Berserkers and have them fight at the start of the combat phase. Pile in some Hearthguard on your turn into a Flesh-Eater King and take it out before it even gets to swing. As cool as they are, the Lofnir is where it's at for me. 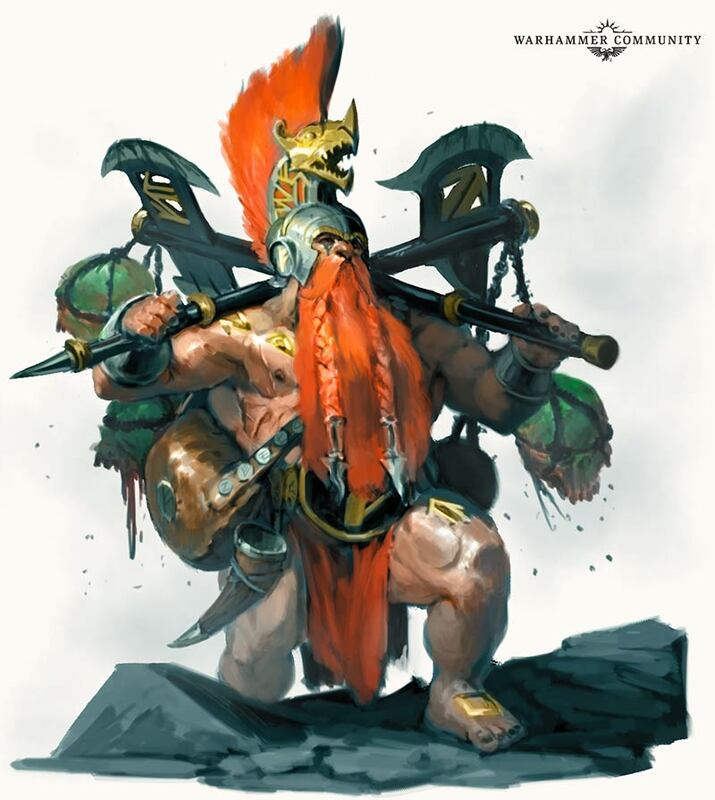 Every army needs a big stompy monster variant, and this is it for the Fyreslayers. All of your magmadroths get to take a magmadroth trait and you also get to take one extra behemoth in a pitched battle game, as long as they're all magmadroths. 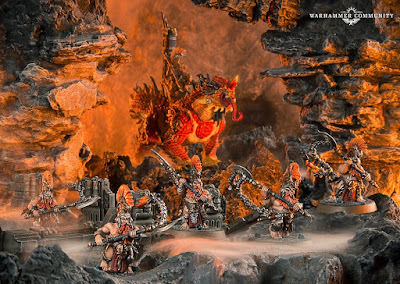 That means five of the fire lizards! The command trait even gives you a buff for charges for all magmadroths near your general. 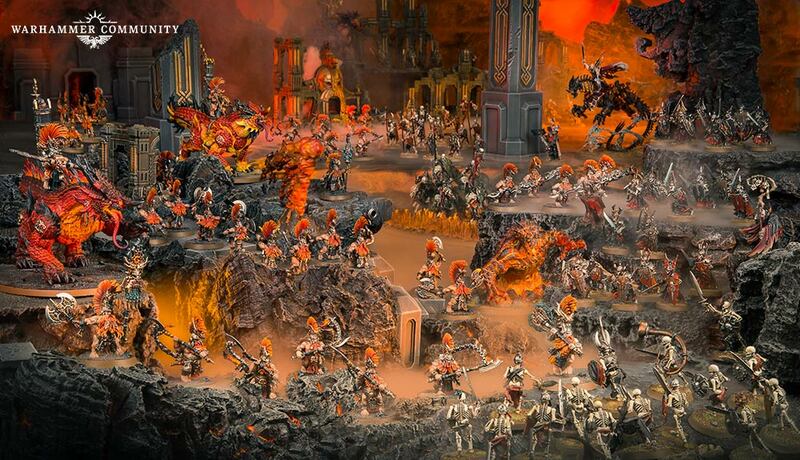 There are four warscroll battalions to pick from, one mega-battalion and three normal ones. These are mostly reworks of older battalions. My favorite is probably the Lords of the Lodge battalion, which is 1 Runefather, 1 Runemaster, 1 Battlesmith, and 1 unit of Heathguard Berserkers. It allows you to pile in and attack for a second time in combat with your Hearthguard Berserkers as long as they're within range of one of the heroes. Imagine combining this with the Hermdar lodge where you can have them attack at the start of the combat phase before anything else, then have them pile in and attack again a second time. That's just brutal! I'm not going to spend a whole lot of time going over the different unit warscrolls since they're all available for free on the app, as usual. There have been significant changes though. Everything now has two wounds minimum, while they have lost a lot of their extra saving rolls, meaning they're still durable, but now you don't need to roll five sets of dice. The magmadroths have all gotten a little boost as well, including a new shooting attack. The entire army have all gotten worse at throwing their throwing axes as well, so you don't need to worry about your army disappearing under a rain of unusually accurate duardin missile attacks. They excel best in combat, where they should. The big additions to the army are the Magmic Invocations. 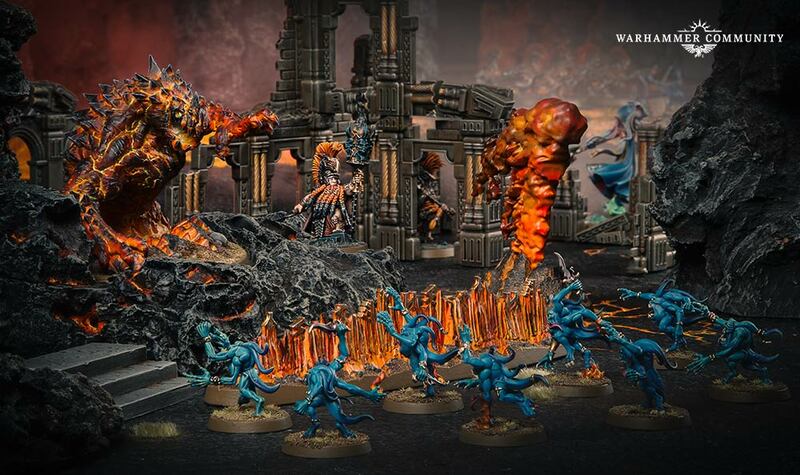 The Molten Infernoth is the coolest looking in my opinion, and it's pretty good, boosting your own bravery, while rolling 12 dices for each unit within 3" of it at the end of its move and doing mortals on 6s. 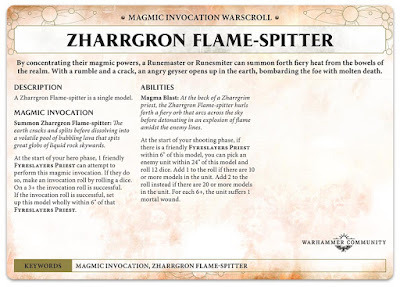 The one I think we'll see the most of though is the Zharrgon Flame-Spitter since it lets you target a unit 24" away. you roll 12 dice, adding 1 to the roll if the target units has 10 or more models, and 2 to the roll if it has 20 or more models, and does mortals on 6s. Against large horde units you're doing mortals on 4s, which is pretty darn good. I really, really like this book. I love the additions to the lore, making them feel more like a real society, albeit one geared towards war, instead of just an army. Their history has gotten fleshed out a lot more as well, and the way the Soul Wars have affected them is really unique. They were pretty devastated by it. The rules are great as well. They have a ton of options to choose from now, and everything feels viable. I think there are several different army builds in this book that will all work equally well, and the choices in traits and artifacts are fairly balanced as well. 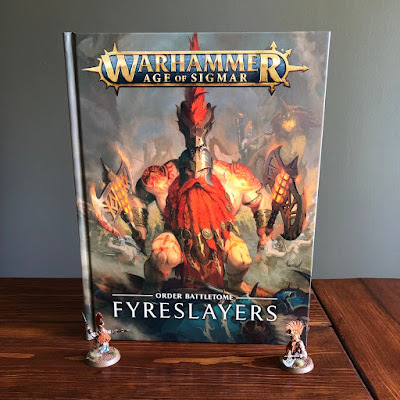 This feels like a really solid battletome and I think we'll see a lot more of the Fyreslayers on the table. Depending on what you take in your army now it might be a fairly small force as well, which is nice for a slow painter like me. If you're a fan of duardin then this book is definitely for you.